You can call us at (305) 257-8045 for any car related questions. Answers to your questions, including general pricing information, may be found in our Frequently Asked Questions — Please note we do NOT sell parts. Note: We do not sell parts. If you are looking for Land Cruiser parts, we recommend Specter Off-road. Yes! We can restore your Land Cruiser. Please read our blog post about Contract Restoration Services for pricing and details. Note: If you are intested in selling your Land Cruiser to us please fill this form . (305) 257-8045 By appointment only. (970) 300-3320 By Appointment only. (214) 550-2853 By appointment only. In the meantime, we invite you to check out our frequently asked questions or learn more about our restoration process. Cloaked in the same coat of armor it's worn for decades, and equipped with renewed vitality, this custom-built FJ40 Land Cruiser is enjoying its second life in Spokane, Washington. 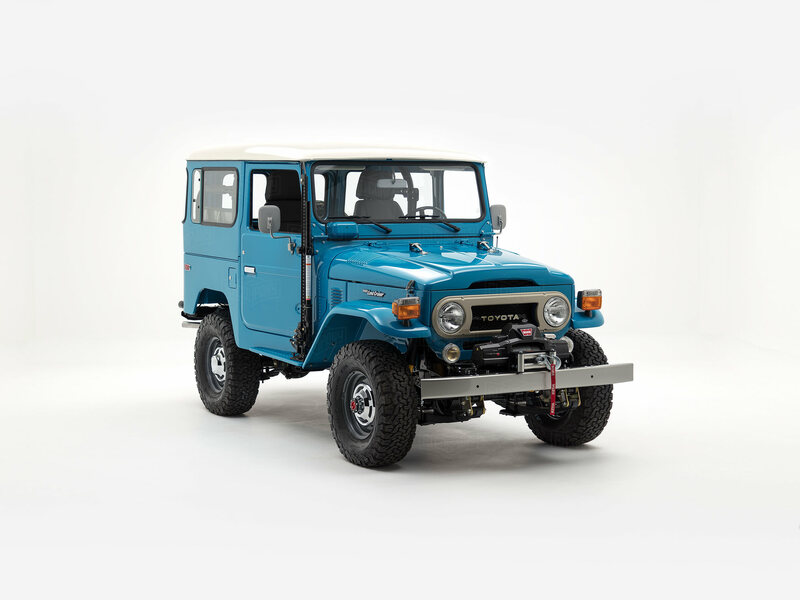 This FJ40 was perfected through our restoration process, and repainted in the stunning shade of Toyota Sky Blue (854). For a rugged, yet refined look, this FJ40 rolls on heavy-duty all-terrain tires and is equipped with a Hi-Lift® Jack, Warn ZEON® 8 winch, rear tow hitch and utility light. Perfect for casual driving in any altitude, this classic roamer is powered by Toyota’s 2F engine backed by an upgraded 5-speed manual transmission. Old Man Emu suspension and revamped power-steering take the driving experience to new heights, while the front disc/rear drum brake combination provides plenty of stopping power. Four-wheel drive components are restored to their original greatness, and stand ready to meet demands of the pavement or the trail. The interior cabin exudes a toughness and refinement that is 100% pure Land Cruiser, and includes many conveniences we enjoy today. The interior is wrapped in gray vinyl, and features an exposed metal dashboard with retro controls and illuminated digital gauge cluster. For your entertainment and comfort, you’ll also find climate control and a marine-grade entertainment system with Bluetooth®. That retro look you love now comes equipped with a more modern powertrain. Build your own G40 Heritage by The FJ Company today! We're happy to answer any questions you have. Just send us a message below. For general pricing inquiries, please read our FAQ. Sign me up for email updates from The FJ Company. Your message has been sent. In the meantime, we invite you to check out our frequently asked questions or learn more about our restoration process. Sign up to get our featured builds sent to your inbox each month. The FJ Company is an independently owned and operated business and is not affiliated with the Toyota Motor Corporation or Toyota Motor Sales, U.S.A., Inc.
All rights reserved, © 2013 - 2019 The FJ Company, an affiliate of Classic Motors LLC.